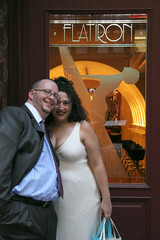 The day we got married, Jen and I corralled our wedding party and celebrated with drinks at Flatiron Lounge. Six months later, it’s time to celebrate, so my bride and I convened Friday evening at Flatiron for after-work drinks. Because I leave work at 4:15 each day, I find it fun to arrive at a good bar like Flatiron or Pegu early so that I can sit grab a stool and talk to the bartender before he or she gets weeded with the after-work crowd. We’ve been back to Flatiron twice now since the wedding, and both times bartender Katie has provided our drinks service. She’s friendly, professional, and easy to talk to, so it’s fun to go in and chat a little about drinks. I knew already that I wanted to start with a rum-based drink. I’m still learning rums. Too many experiences with badly mixed Captain Morgan drinks have turned me off the taste, I’m afraid, but I know it’s important that I rectify that if I’m to be serious about this hobby. So it’s time to develop my palate. Luckily, Flatiron had mai-tais on its guest-mixologist menu; a classic drink for all the right reasons, a well-mixed mai tai is balanced and tasty. I know I’ve had them before, with cheap rum, poured to the point of overpowerment. Sad. But Flatiron does them right, of course, so I asked Katie what rum she used for it, and she showed me the bottle of Appleton Estate. This sparked a good conversation about rum brands, distilling methods, cane syrup vs. molasses, and so on. I had nearly finished the mai tai when Jen arrived. I let her sample some of the remainders, and she liked it too. It’s one for the repertoire. Jen and I worked through the menu. My second was a Singapore Sling, while Jen ordered a Gin Shagler for her first–muddled cucumber and mint, mixed with gin and topped off with Champagne. Quite tasty. I then ordered a Negroni, but Jen stumbled her way into something interesting. I blogged earlier about going to Dressler and getting served an impromptu Seelbach. We’ve experimented a bit with the recipe at home, and Jen wanted to see how Katie would make one. When she came back, she sat down my Negroni and a fluted drink for Jen, who took a sip and was pleased. Katie said, “That’s a Red Hook, but topped with Champagne.” Paul’s got more on the Red Hook at Cocktail Chronicles, but it’s basically a variation on the Brooklyn cocktail. Made with rye, Punt y Mes, and maraschino, the Red Hook is hard-bitten and ribald, and the champagne smooths it out without sacrificing its character. Think James Woods in a tux. Jen liked it enough to have two. For no good reason, I’ve absented this blog for a few days, but I wanted to point out this good article from the LA Times about boutique gins. (Be sure to check out the tasting notes while you’re there, too.) Among the gins reviewed are several that Jen and I have talked about sampling ourselves–most notably No. 209 and Citadelle. We were at Nina Planck’s Real Food Market this weekend, in NYC’s Petrosino Square, where we met some friendly picklers from Wheelhouse Picks. Among their delights were some yummy turnips, pickled in Hendrick’s gin. We grabbed a jar of those turnips (along with a yummy bread and butter that’s not as sweet as the norm), thinking the Hendrick’s turnips would make a lovely martini garnish. Alas, I’ve not gotten around to mixing up martinis this week. Another project will be to pickle up some thinly sliced cukes in the Hendrick’s.